Traveling is so important, no matter what age you are or what income you make. In order to get the experiences and benefits traveling brings, you have to take a leap of faith. There are so many benefits because of traveling, especially while you're young and in college. Here's some that might get you thinking. 1. You're young enough to be adventurous, but old enough to enjoy the world in it's full potential. Traveling while you're young results in way more spontaneous and interesting experiences than when you're older and actually think rationally about every situation. You're more likely to bungee jump of the tallest bridge in the world or eat something completely scary, but you're old enough to appreciate the beauty each country and culture has to offer. 2. You can find yourself along the way. While you're in college, finding who you truly are is common. So traveling when you're so open to new things, could result in potentially finding yourself along the way. When you're older, you are set and stone on the person you are and the influences of other cultures might not become a part of you or impact you the same way. 3. You have less responsibilities at home. 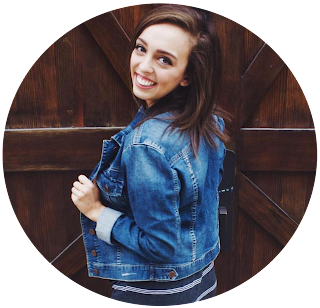 Sure, college students have responsibilities, but not nearly as much as grown adults. They have work calls they have to make, families to take care of, car and house payments... the list goes on and on. Why not travel the world when you don't have to worry about that stuff and can focus on the experiences? 4. Investing in travel is like investing in education. When you travel, you learn so much from the people of your destination, which can broaden your horizons exponentially. Visiting museums and historical monuments allows you to learn the history as well. Traveling to any place in the world, whether it's 30 minutes away or 30 hours, is an education experience. So travel. Travel far and travel wide. You deserve to experience all of the beauty the world holds and learn about the many different people in it as well as yourself. Yes, yes, YES! 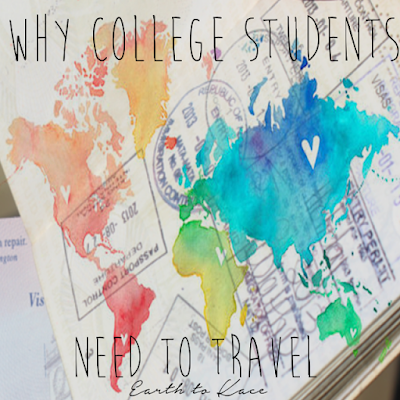 All excellent points about traveling while in college! I traveled throughout my college years and although I still travel with my family today, it's definitely more challenging: more people to organize, a lot more cost, more schedules to coordinate, more everything. 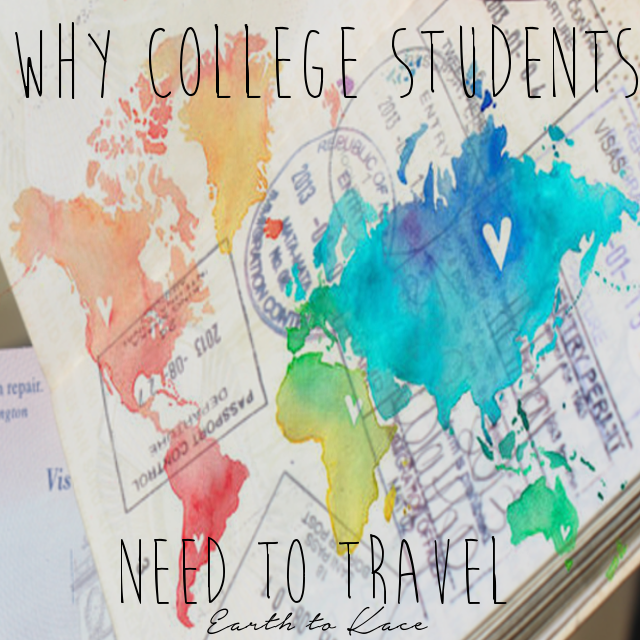 Traveling while in college was one of the best things I did and I can't agree enough with your points in this post! Thank you so much! That really means a lot! I just started traveling and I already can't get enough! This post is AWESOME!!! I'm a HUGE advocate for getting people to travel. I went to Jamaica in college and it opened up my eyes to a whole new world and culture. Love this! Right?! When I went to South Africa, I felt the same way! Thanks for the comment Chelsea! I wish I would've been able to study abroad in college -- my one regret. I have yet to study abroad, but it's definitely on my list be graduating! Thanks for the comment, Jenny! I agree with you. Travel is such an education; do it before you get tied down with house payments, etc. Love this and agree with it completely. I made a trip to Thailand a few months back and it was a spur of the moment decision so money was figured out after it was booked and just a deposit was made - and I truly loved it that way, feeling as though my money or study situation wasn't determining my young adulthood. Yes! That's how it was for my South Africa trip! It was amazing and so exhilarating! Thanks for reading!